The flickering of LED lamps has become important and carries the interest of many people, as it can lead to eyestrain and headaches. The driver of the lamp is the cause when the LED source flickers. Certain aspects of flickering are of importance: the level of flickering, the frequency, the sensitivity of the person subjected to it, whether there are other lights nearby that do not flicker. 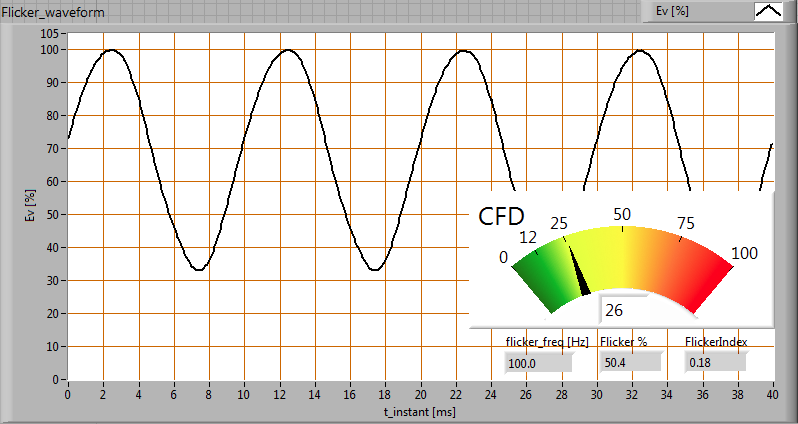 That what OliNo measures are the most known parameters as flicker frequency, the modulation depth of the flickering and the flicker index (a form parameter). These parameters give an impression and describe the flickering, but do not give a final verdict whether the flickering is noticeable, moderately present, strongly present or extremely present. Peter’s parameter is about to change this situation. He has analyzed many investigations about this subject and created a parameter that seems to be complete. 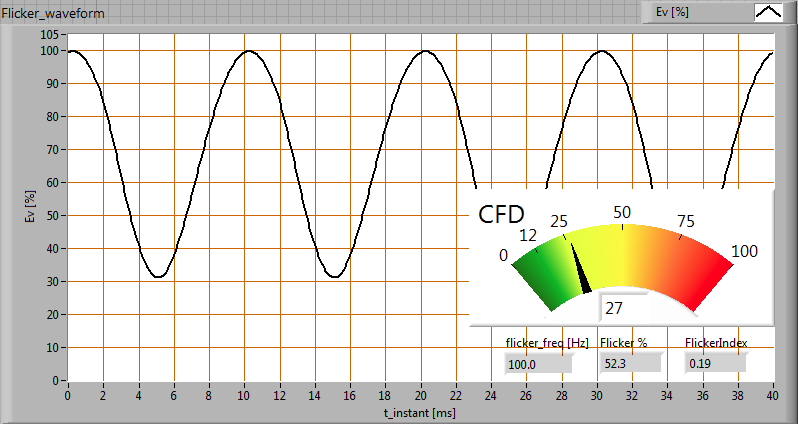 He calls it the Compact Flicker Degree (in German: Kompaktflimmergrad) or in short CFD. The CFD is a single number that indicates whether the flickering is imperceptible, acceptable, moderate, strongly affected or heavily affected (and the last two often are not acceptable). He also uses a color-coding like a traffic light, to make clear in a visual way how heavily the LED lamp flickers. OliNo will report this parameter also in the chapter about flickering. A number of examples of how the parameter will be visualized are given at the end of this article. 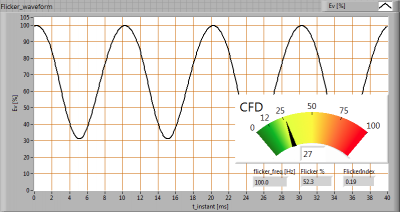 Also the results reported already since a long time (flicker frequency, modulation depts and index) are given for those examples, so that these can be compared. 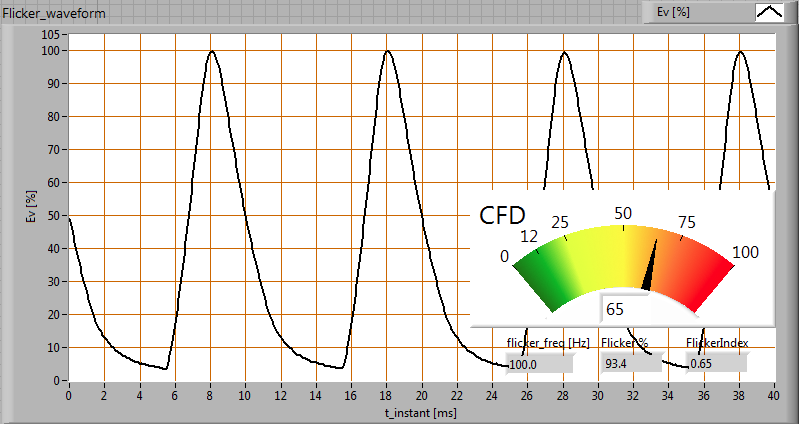 The CFD is the only parameter that gives a final verdict. With his work, der Lichtpeter wants to help the (lighting) community to give a means to evaluate the flicker behavior of a lamp. His website gives more info about this parameter together with a number of examples. He has developed a specific test device that drives any lamp and tests it for its flickering behavior (including dimming when applicable). He also delivers these tests as a service and operates as a consultant when requested. The by him defined CFD parameter has emerged from a lot of investigations on what is known about flickering and the effect on human beings. To determine his parameter one starts with a fast measurement of the illuminance level emitted by a lamp (minimally 20,000 samples per second), during one second. 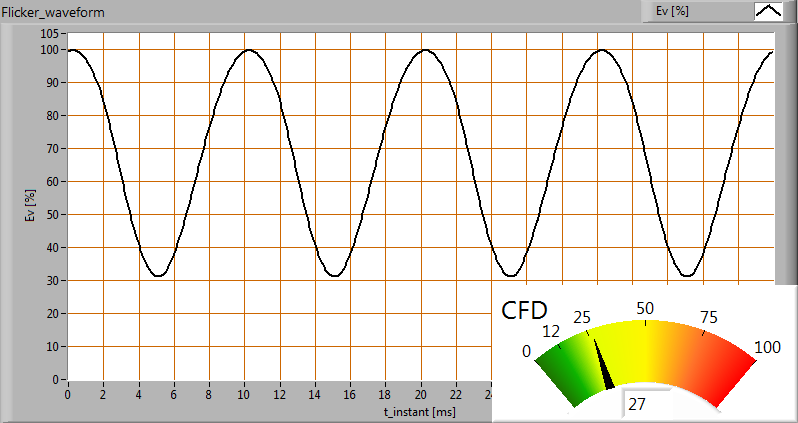 When this signal shows variations in time (so it flickers) then normally these variations are periodic (repetitive). 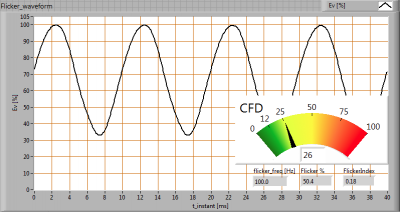 This repeated varying illuminance signal is then converted into a number of pure sinusoidal signals (Fourier transform) and every frequency is first divided by the DC signal value (called A0) and then weighted appropriately according to its frequency; see also the next graph. 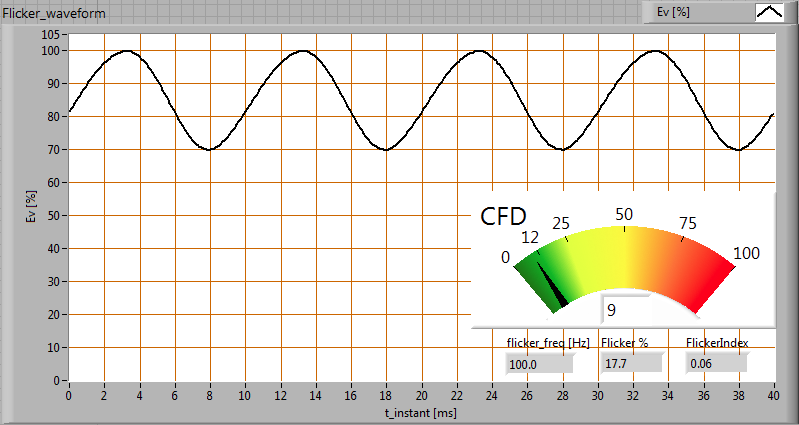 The CFD line shows how the derived different sinusoidal flicker frequencies must be weighted. For example: when the total flicker signal would consist of a set of 4 sinusoidal frequencies of 10, 30 100 and 200 Hz, then these four frequencies should be weighted with respectively the following factors: 157, 53, 1.05, 0.66. 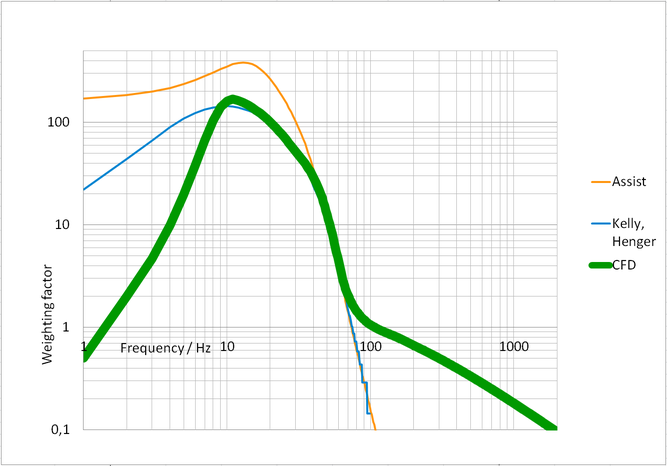 This shows that a flicker frequency of 10 Hz is weighted much more than a frequency of 100 Hz (the human is more sensible to 10 than to 100 Hz). And that the effect of a 200 Hz flicker frequency signal with equal amplitude as an 100 Hz signal, is still 2/3rds of that of 100 Hz. The vast majority of the LED lamps that OliNo measures show a flicker frequency of double the grid frequency (2 x 50 Hz = 100 Hz). This is what we call the ground frequency. 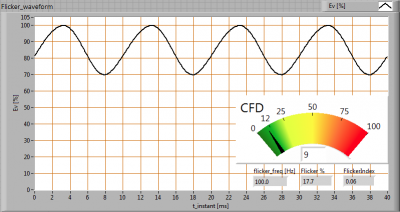 If the total flicker signal is not sinusoidal, then it can be composed into the sinusoidal signals of the ground frequency and a number of higher harmonics of it (harmonic is then a sinusoidal signal with a frequency that is a multiple of the ground frequency). 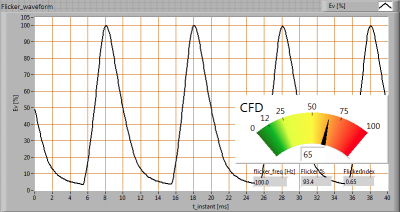 The CFD computes all the sinusoidal components up to 1,000 Hz, as shown in the graph (with a from 100 to 1,000 Hz decreasing weight factor). When all single sinusoidal components are weighted, then all these components are squared, summed and then the square root is taken of this total sum. This is finally the CFD result which is expressed in %. where A0 is the DC component of the signal, Ak is the amplitude of each found harmonic, MW(f) is the weighing function and 100 is used to make the result in %. All components are squared, summed and over the result the root square is taken. 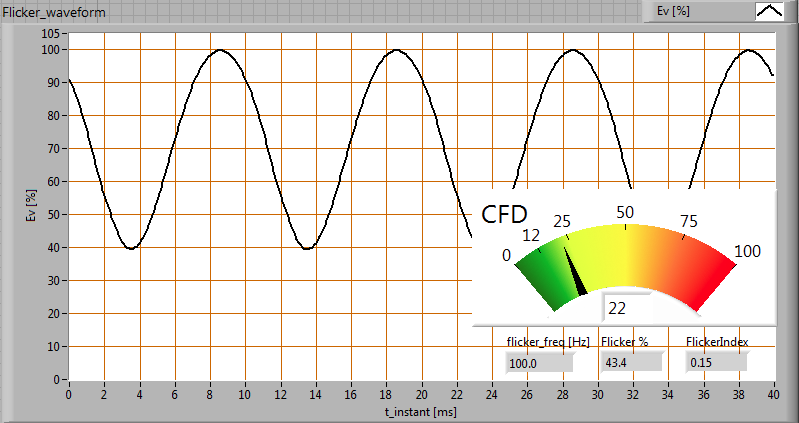 The CFDFB means CFD Frequency Based which is also abbreviated to CFD. 1-12 %: imperceptible; deep green. Fine for work environments. 12-25 %: acceptable flicker level; yellow green. Maybe not suitable for work environments, where (for this flickering sensitive) people work (more than) 8 hours and especially where this light is the only light the people has. 25-50 %: moderate flicker level; yellow. Already not good enough for work environments. Possible for home situations and in parking lots and street lights. This part of the article is meant as a guide or help of how to use the CFD result. This parameter shows with help of a color the flicker behavior of the lamp. In work environments, where people always have to work safely, one should not use lamps with an orange level of flickering (not above the 50 % CFD value). 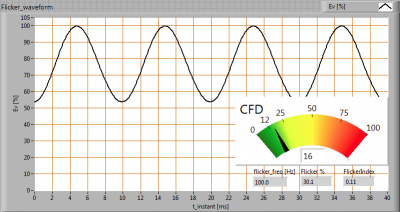 This flicker level can result in stroboscopic effects where rotating machines may appear to stand still! In work environments the people work often (more than) 8 hours per day and then even lamps with moderate flicker behaviour will then most likely result in people with eyestrains or headaches. As an example, the CFD parameter for the fluorescent tubes mentioned in this research was only about 20! So for work environments the advice is to use lamps with the green level (less than 12 %). For pivate functions or environments one could take the same guideline. Since what is not good for work environments we also do not need to accept for home situations. However, if one considers lights in a house that are only used for a short amount of time (toilet, hall, basement, attic? ), then one could also accept a higher level of flickering. 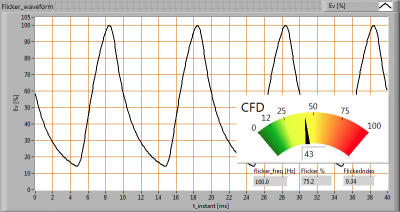 Note: the load on a human being depends on the level of flickering (CFD) and the time duration one person is in it. It is of importance that this parameter is provided for all lamps so that buyers are well informed about flickering. When lamps are dimmable and used as such (which is likely), then also the dimming position needs to be measured. Dimmers used in private homes are the ones built into walls, often with a turnable knob. These are positioned in the electrical circuit in the position of where a switch would be (connected to the phase wire (brown) and the switch wire (black) that goes to the lamp). These dimmers function by cutting away parts of the voltage sinusoidal signal; the more dimming, the more of the voltage signal is chopped and vice versa. A voltage that does not look like a nice sinusoidal signal but where parts are cut away from it, will most likely result in more flickering of the light of a lamp fed by that voltage. So this situation needs to be measured and analyzed. Peter has determined that the lamp then needs to be dimmed such that only 25 % of the light results compared to that without dimmer, and that the lamp in this situation needs to be measured. The highest value of the CFDs determined (with dimmer at 25 % light output and without dimmer) then determines the CFD value for this dimmable lamp. 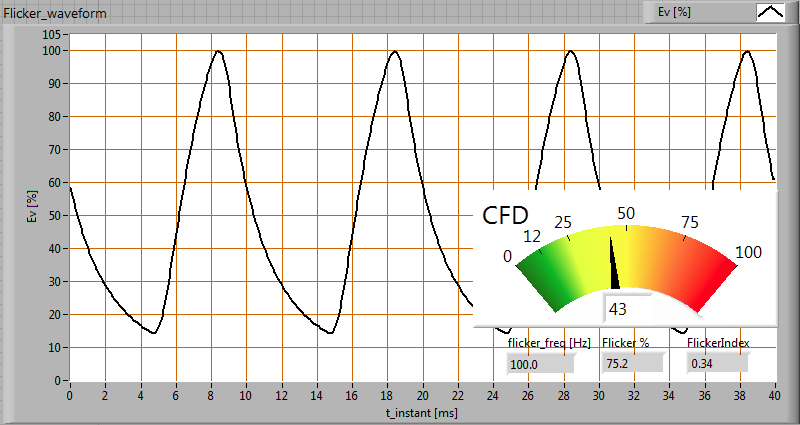 Note: OliNo does not automatically measure the CFD in dimmable position. 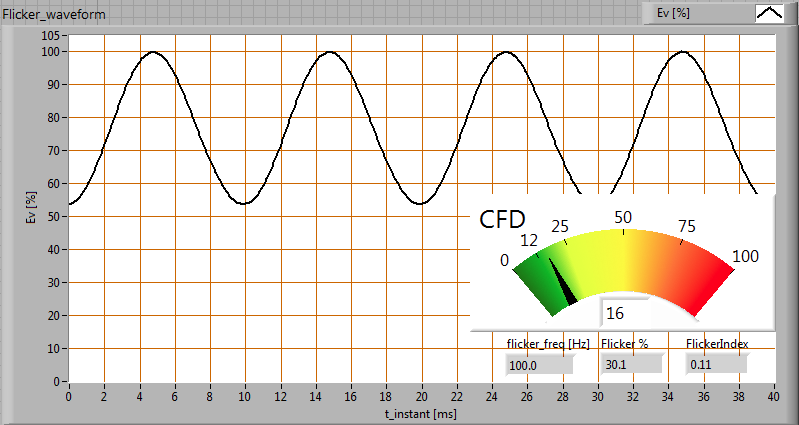 This is an option, as is the dim-measurement itself as well. There are other ways that LED lamps can be dimmed, where the feeding voltage is not chopped. These lamps have drivers with separate dimming inputs on which a voltage, signal or resistance is connected to indicate the driver to what level the lamp should be dimmed. It is to be expected that these dimming methods do not necessarily lead to a higher flicker level of the lamp. In this part a number of examples of flickering of lamps. The CFD results are given, as well as the since years reported flicker results. 43 %, moderate flicker level. 27 %, moderate flicker level. 26 %, moderate flicker level. 22 %, acceptable flicker level. 16 %, acceptable flicker level. 9 %, imperceptible flicker level. 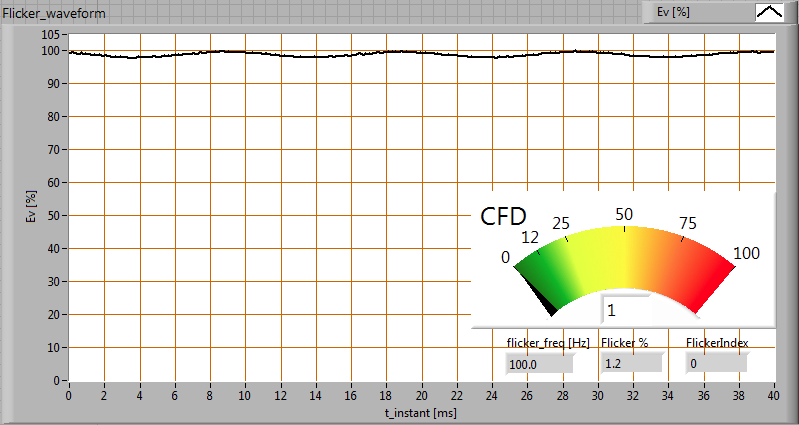 1 %, flicker free or imperceptible flicker level. Website Der Lichtpeter. For info about the CFD. He created the parameter. Examples, as well as the background of the creation and the explanation of how to compute it, can be found there. Want to know more about relevant parameters of led lamps? See the explanatory articles here.